Various hairstyles allow women to express their individuality and style! When thinning of hair or baldness occurs, it can impact a woman’s self-esteem and confidence. These conditions of hair loss can be genetic or be caused by poor nutrition, hormones, sickness, or from certain medical treatments. Minimally-invasive hair restoration techniques, such as NeoGraft®, are helping to combat hair loss and female pattern baldness. Learn more about NeoGraft® below! What Is The NeoGraft® Procedure? NeoGraft® is an FDA approved follicular unit harvesting and hair implantation procedure. It uses pneumatic controls to remove individual hair follicles from the donor area of the scalp, which are then transferred and implanted where hair loss has occurred. NeoGraft® is revolutionary as it avoids scarring and incisions while creating natural and permanent results! NeoGraft® uses the most advanced and automated technologies available for hair restoration. This hair transplant treatment involves no incisions and can give you superior results. NeoGraft® is a gentle procedure that provides minimal discomfort with no scalpel, incision, or scarring. Additionally, NeoGraft® requires little to no downtime; you can expect to return to your normal routine after a few days. Most importantly, NeoGraft® is known for its effectiveness and high success rate for hair restoration! Our doctors and staff welcome any questions you may have regarding NeoGraft® treatment. You can contact us at 877.333.3223 or request an appointment online at one of our Florida locations: Melbourne, Orlando, Metro West Orlando, The Villages®. Microneedling and PRP injections can minimize signs of aging, hyperpigmentation, acne scars, stretchmarks, and more! This non-invasive cosmetic treatment can help you attain smoother and firmer skin. Learn more about microneedling and PRP skin care treatment below! What Is Microneedling & PRP Treatment? Microneedling, also known as collagen induction therapy, is a skin rejuvenation procedure that uses the COSMOPen device, which contains fine needles to create microscopic punctures to the targeted areas of the skin. Platelet rich plasma (PRP) is used in combination with microneedling to improve skin structure and elasticity. Microneedling will help absorb the PRP injections, while the PRP stimulates healing and helps create new collagen fibers to improve cosmetic outcomes. The microneedling and PRP treatment can be completed approximately under 1 hour. A series of microneedling treatments, as much as 3-5 sessions, are suggested for optimal results. This procedure requires minimal downtime and patients can continue their daily routine within a few days. Microneedling and PRP treatment is suitable for all skin types! Individuals who have stretchmarks around the abdomen, thighs, buttocks, and legs or who have wrinkles, fine lines, acne, and sun-damaged skin are great candidates for the microneedling and PRP cosmetic treatment. Mirconeedling and PRP treatment will help smooth and firm away imperfections! Our doctors and staff welcome any questions you may have regarding microneedling and PRP treatment. You can contact us at 877.333.3223 or request an appointment online at one of our Florida locations: Melbourne, Orlando, Metro West Orlando, The Villages®. Weight gain, aging, and genetics are all factors that can contribute to a loss of facial definition. If the stubborn fat under your chin or upper neck, called submental fat, is making you feel embarrassed or unhappy, Kybella™ can help you achieve a sculpted profile. Kybella™ is FDA-approved and is designed to give patients a youthful, natural-looking appearance. Learn more about Kybella™ below! Kybella™ is a nonsurgical injectable solution for patients experiencing excess fat below the chin, also known as the “double chin.” Kybella’s active ingredient called deoxycholic acid—a naturally occurring molecule that helps break down dietary fat—is inserted into the targeted area(s) to destroy fat cells. Once these fat cells are destroyed, the cells will not be able to accumulate or store fat. In order to achieve optimal results, patients will receive Kybella™ treatments over several months—depending on the patient and how much submental fat is present. 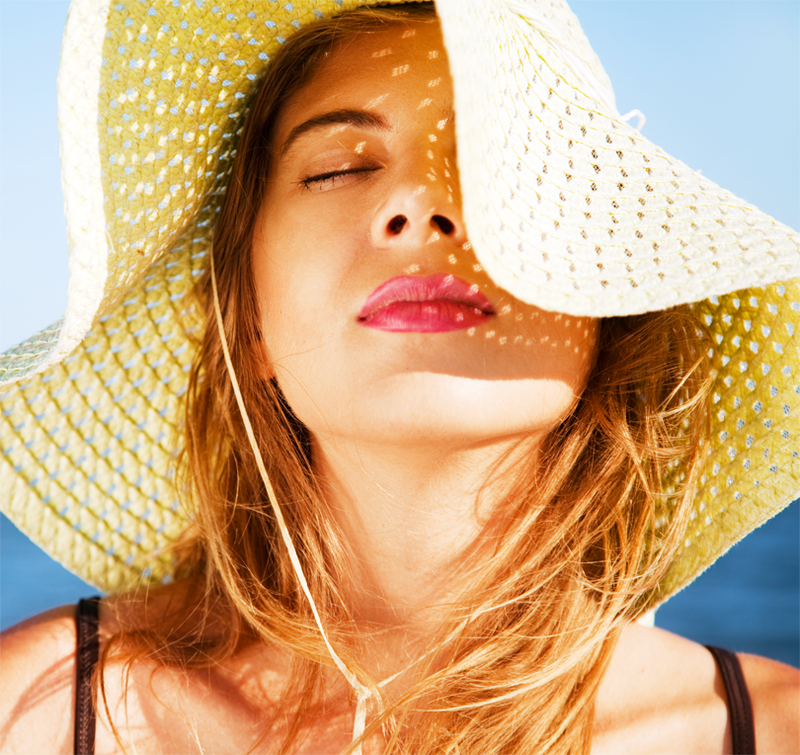 On average, a Kybella™ cycle may range from 2-6 injections and can last approximately 15-20 minutes for each session. Dr. Bassin and his team of doctors will work with patients on creating a personalized Kybella™ procedure plan to produce long-lasting results. Furthermore, results will continuously improve over the course of the procedure. Kybella™ is a safe and effective treatment for anyone who has moderate to severe submental fat. It can help achieve a patient’s aesthetic goals and is an effective alternative to neck liposuction or surgery. Our doctors and staff welcome any questions you may have regarding Kybella™ treatment. You can contact us at 877.333.3223 or request an appointment online at one of our Florida locations: Melbourne, Orlando, Metro West Orlando, The Villages®. Laser Hair Removal Treatment for Silky-Smooth Skin! Constantly shaving, tweezing, or waxing unwanted hair to achieve smooth, baby-soft skin can get tiresome. Razor bumps and ingrown hairs can also be a nuisance and at times hard to treat. If you are looking for a quick and easy solution that can remove either your facial or body hair, laser hair removal may be right for you! Bassin Center For Plastic Surgery is proud to offer a non-surgical laser hair removal treatment that can help get rid of unsightly hair in a variety of areas, while also achieving long-lasting results. Our laser hair removal specialist utilizes the Candela GentleMax Pro® laser that carefully targets and removes hair. Laser hair removal is a non-surgical procedure that prevents the growth of hair follicles with precision. It is not designed to trim unwanted hairs—it removes them at the source! Candela GentleMax Pro® laser hair removal can target the underarms, legs, bikini area, upper and lower back, face, chin, or neck. Additionally, the Candela GentleMax Pro® laser hair removal treatment can eliminate razor bumps and ingrown hairs. In a cycle of 5-7 treatments, the Candela GentleMax Pro® laser delivers a pulse of light that is absorbed by each hair follicle being targeted. The energy from the laser destroys the hair follicle with the heat it produces, thus extinguishing the hairs in a fraction of a second. The Candela GentleMax Pro® laser has a cooling device to help decrease any discomfort and pain during the process. Anesthesia or pain medication is usually not needed during or after the procedure. There is little-to-no downtime following treatment, therefore, patients are free to resume their normal day-to-day activities. Unlike most laser hair removal devices, the Candela GentleMax Pro® can remove hair for all skins types and hair colors. Individuals who are weary of the time they invest on shaving and waxing, or who are having difficulties in treating their ingrown hairs or razor bumps may be candidates for laser hair removal treatment. 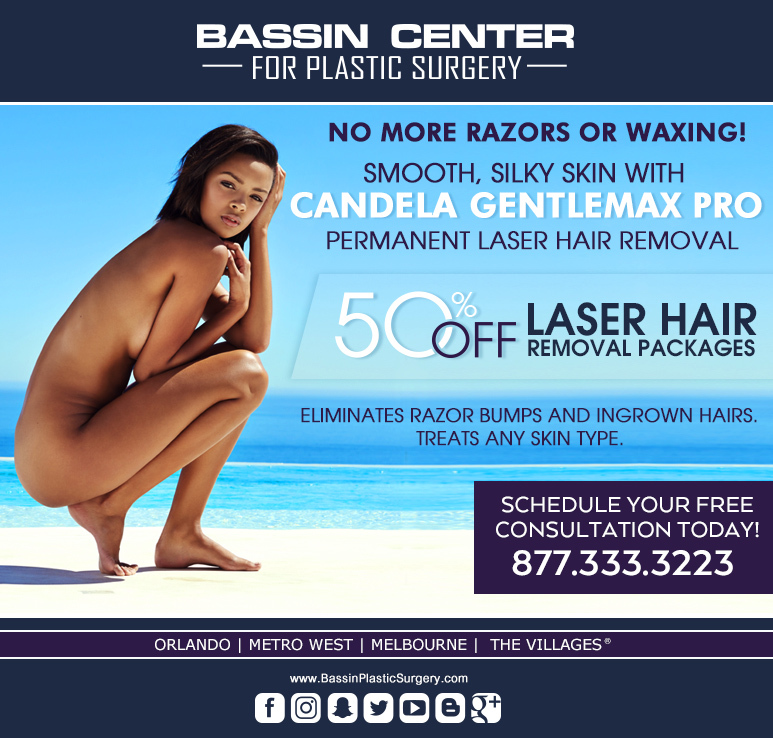 The Bassin Center For Plastic Surgery is offering a 50% off laser hair removal packages for a limited time! Book your free consultation today! Our doctors and staff welcome any questions you may have regarding laser hair removal treatment. You can contact us at 877.333.3223 or request an appointment online at one of our Florida locations: Melbourne, Orlando, Metro West Orlando, The Villages®. Introducing Scalp Micropigmentation For Thicker Hair! Would you like to add natural-looking fullness to your hairline without undergoing surgery? Scalp micropigmentation (SMP) is the latest non-surgical hair loss solution for patients experiencing receding hairlines or pattern baldness! Scalp micropigmentation can replicate your natural hair follicles by transferring pigments to areas of the scalp that have thinned or lost hair. SMP treatment can yield long-lasting results. Learn more about scalp micropigmentation below! Scalp micropigmentation uses a specialized device to transfer pigments to the scalp. These pigments can be customized to replicate the natural color of your hair. Your SMP specialist can replicate thousands of hair follicles in one session by carefully filling in areas of thinning hair across your hairline. Is There Downtime Following Scalp Micropigmentation? There is no downtime following scalp micropigmentation and patients are free to resume their daily activities immediately. Slight redness around the scalp is common for a few days following SMP treatment. You should avoid scrubbing, shaving, or rinsing your head for at least a week following your scalp micropigmentation procedure to allow for optimal healing. What Results Can Scalp Micropigmentation Achieve? Scalp micropigmentation is designed to achieve natural-looking results lasting years. By matching your natural hair color, SMP can restore a natural-looking, fuller hairline. Touchup appointments are required to maintain your scalp micropigmentation results. If you are experiencing a receded hairline, then scalp micropigmentation may be right for you. SMP is ideal for recreating close-cropped hairstyles and can mimic the appearance of thicker, denser hair. Scalp micropigmentation can also cover up scarring from previous hair transplant procedures. Our doctors and staff welcome any questions you may have regarding scalp micropigmentation, as well as any of our hair restoration procedures. You can contact us at our Melbourne Hair Restoration office at 321.872.0511, our Orlando Hair Restoration office at 855.234.4247, our Tampa Hair Restoration office at 855.459.4247, or our Jacksonville Hair Restoration office at 904.996.0030. You may also request an appointment online for a personal consultation with our doctors. Copyright © 2019 Bassin Center for Plastic Surgery. All Rights Reserved.